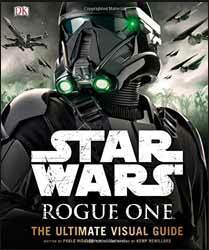 Authored by Pablo Hidalgo, who is the resident authority within the Lucasfilm Story Group and so helps ensure consistency across a wide array of Star Wars projects, this is a glossy coffee table style companion to the smash hit film. That it exists is no surprise but is it just a flimsy cash in or worth the £17.99 price tag? I reckon it is worth the asking price. The images are super high quality and the text expands on the worlds and characters that appeared in the film. The trivia, maps and timelines reference up and down the canon. The tone of the book is one of complete immersion. This universe exists, is current and the reader is part of it. The detail is rich and rings true. For example Jyn's childhood toys are granted a double page spread despite having maybe a pico second of screentime. I've never noticed them watching the film but my life is better knowing "Bad Mister Goob, Koodie the Tooka and Mr Iggy" not only exist but are also so pleasing to the eye. Other new discoveries, such as The Decraniated of Jedha, are less pleasant but equally fascinating. There are cutaway illustrations of ships and such which outstrip those in the similarly priced Haynes Manual series and the book is a godsend to anyone searching for costume references. This granular level of care is, for me, one of the reasons Rogue One was such a complete delight. The fact those itty bitty details have even more joys to give is incredibly pleasing. As a kicker the book ends with a real-life section with a smattering of concept art and some cute behind-the scenes shots. DK obviously realise that the world is beyond saturated with Star Wars merch and in order to stay ahead of the game they need to offer something exceptional and they have succeeded.